That’s right, I went to Warhammer World today! I’ve been before, but I don’t think I’ve really written up much about the tabletop Mecca on this here blog before, so I thought I’d share some of the photos I took while I was wandering around the exhibition area! The exhibition hall is a bit smaller than it was when I first went, back in 2015, partly due to the extension of the shopping areas. 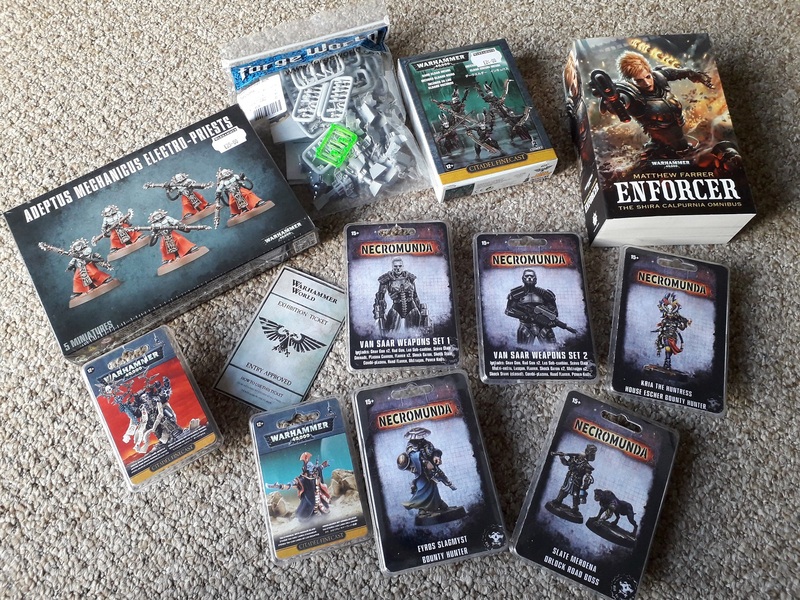 It’s broadly divided into two, of course – Age of Sigmar and 40k – with some of the smaller games like Blood Bowl and Necromunda having some floorspace along the way. The exhibition is partly a museum of Citadel miniatures, featuring cabinet after cabinet of all the minis that we know and love (those shown on the box-fronts and within Codices), and partly a display to fire the imagination, with set-piece exhibits that show you what can be done with the models – as well as providing a little bit of imaginative realisation, showing to us all what we see in our heads every time we play a game! 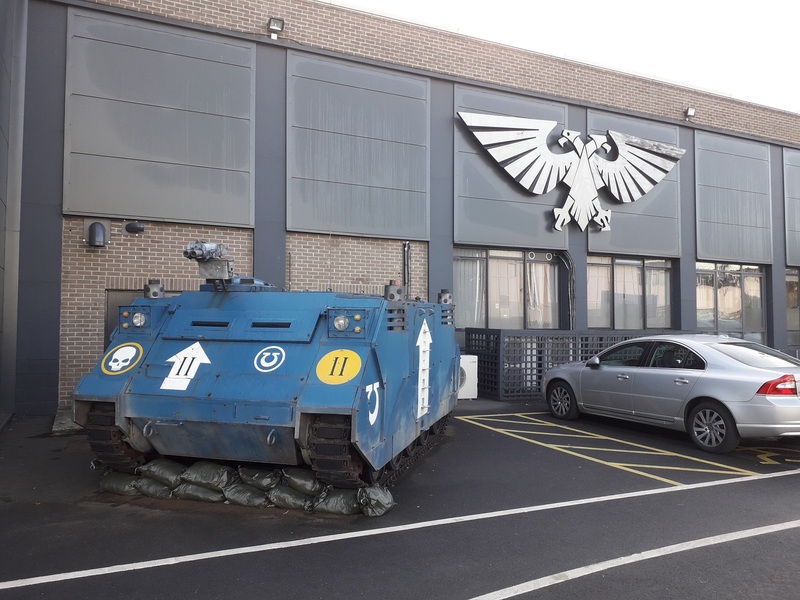 40k is what I always enjoy seeing when I come to Warhammer World, and there have been a couple of new exhibits added since my last visit. It’s quite the showcase for just what can be achieved with these terrain kits, and I had to stop myself really quite hard from buying any of them when I emerged! There are all manner of lighting-effects on this board, making getting a photo of it really tough. It really needs to be seen to be believed! There are sadly no displays that feature my beloved Dark Eldar, but there are some Necrons and some Tau, so it’s nice to see my other xenos armies getting some love! All in all, it’s a fantastic place. Tickets for the Exhibition Area are £7.50, as of this writing, and while I think I was only there for an hour, this place is tremendous and well worth it for any hobby enthusiast to come and get lost among the models for a while. I live about 2 hours’ drive away, so I’m hardly local, and when I do go I tend not to want to hang about there, but it’s always been so worthwhile going to have a look at all of the stuff on display. While I’m not currently in anything like a hobby slump, I have been feeling a bit all over the place lately with my painting, so I think today’s trip has really helped to focus me on getting down to finishing some models off now. There are a lot of things I want to get done, and quite a few things that I can probably try to offload, so I’m definitely feeling more focused now! Lucky you man, wish i could join one of these some time. I’ve heard good things about it, so hopefully I’ll get to it over Christmas and see what all of the fuss has been about!! Do you have any idea if a person needs prior knowledge before picking this up? Or can it be read as a stand alone,? I read a little here and there where they feutured in some novels, but never realy knew what or where they came from. With Carchrodons earlier this year by Robbie McNiven it featured them aswell and I understood a small part of their role in the imperium. I’ve not read any of the Carcharodons novels yet – good to know they play a part though, I may well pick up a copy! There was one of the Beast Arises novels that featured an enforcer as a major POV character, can’t remember which one now, but that was really good. They do crop up as you say, but I get the impression this omnibus is a definitive series, so might have everything we’re looking for as regards the Arbites!! I’m in Australia so it’s a fair hike but one day, Mark my words, one day I’ll go and may not return haha. Is Forgeworld, the shop, based there too? It gets you like that – could just spend hours looking at all the displays! Yeah, I think it’s the only physical FW shop in the world? Though the new place in Texas might have something there as well. Hopefully you’ll get something in Australia one day, GW seem to be better than they were with that sort of thing, it’d definitely be cool to see them open an Australia HQ or something!